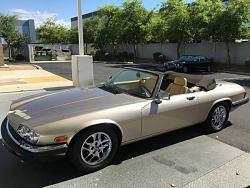 I saw a local '96 XJ12 on eBay a couple weeks ago. The car looked good and it was close, so I drove the hour to see it. The owner said the car doesn't have power like it used to and might need a new engine. He's puzzled as to what happened. The CEL was on, he needed to pass emissions, and the shop he brought it to was intimidated by the mighty V12. The car started and idled perfectly, flawlessly. Not even a bit of a misfire, no smoke blown on startup, warms up to operating temperature fine, no knocks or ticks or strange noises... No issues so far. Open the throttle, though, and the engine wouldn't rev above 3000 RPM, sounding weak and starved. P0106 MAP code was set, nothing else. Car wouldn't drive about 35 MPH or so, and was VERY labored. I had to hold my foot to the floor to achieve 35, and when the transmission shifted it was VERY harsh. The body is mint, interior is good, tires are new, not a single speck of rust on the car. I decided to go for it. Seeing as though the engine was idling perfectly, worlds better than my '92 XJ6 idles. I HIGHLY doubted any engine work needed to be done, but figured something more in line with clogged cats (but then a code would be set, most likely...) or the Engine Management System screwing up somewhere. I figured if the car was completely shot, I'd be out less than a grand after everything was said and done... So I went for it. Unplugged the MAP sensor to see if it was throwing off the computer enough to cause no power. Nope, ran just the same. Had the car towed on a flatbed 50 miles home. Once there, I looked around everyone more closely. Opened and closed the throttle linkage, checked for movement everywhere. I noticed something strange. It seemed like there was more movement on the LH side of the engine than the RH side when the throttle was operated. Looking closer revealed that the "throttle lever" clamp, which is tightened down on the splined throttle shaft on the RH side throttle body, was just spinning on the splined shaft when the throttle was operated. Bingo! Tightened the locknut with an adjustable wrench, and in ten minutes, the car was reaching 5000 RPM and had life in it again. The LH throttle was opening as it should, while the RH throttle was always closed. This is the cause of the MAP P0106 code. The throttle position sensor was telling the engine that the car was at WOT at times, while the MAP sensor was seeing very high vacuum instead of very low vacuum, like it should've been if the throttle was wide open. Reset the CEL and it hasn't come back on ever since. It's funny how a stupid little 8mm nut can bring a big mighty V12 down on it's knees. It was even worse than just running on 6 cylinders, it was more like running on 3. I put the car in Drive after the nut tightening, and stomped on the gas, which chirped the tires a bit. That put a big smile on my face. On the drive back home after leaving the tow driver to his thing, I was thinking what did I get myself into. It's all SO worth it now. And this is the throttle linkage that was loose. The little "throttle lever" (as it's called in the parts diagrams) was loose, and just spinning on the splined shaft, instead of twisting it, leaving the RH side bank at idle all the time. Drove the car on the highway after getting the car registered, drives just fine at 65mph down the road, transmission shifts silky smooth now that the engine is running on all cylinders. Don't get me wrong, though, the car isn't perfect, at least to my standards. It needs a new power steering rack (it leaks a little bit) and an alignment, the interior needs to be gone through, some leather needs to be restored, loose clips on the door panels replaced, the outside needs to be polished, touched up, and waxed. The CD changer isn't recognized by the headunit (NOT CONT error), the subwoofer on the rear parcel shelf rattles like it's blown, both front tweeters aren't working, the sunroof is a little slow for my liking, the memory function for the driver's seat doesn't work, the front passenger's heated seat doesn't work, the clock needs to be repaired, the A/C needs to be recharged, the right brake light stays on full brightness when the parking lights are on (bad lamp control module? ), car is missing a spare full size wheel/tire and the jack/tools, and of course, the cup holder is broken. So mechanically, I'm needing a new steering rack and alignment, and A/C recharge. Everything else is minor, or electronic or appearance related. I'm a fanatic about my XJ6 and I'm very particular when it comes to everything, and I have no doubt this car will be the same. I'm bringing it today to my Jag guy and we'll put it on the lift and give everything a good once over. Congratulations are in order!! 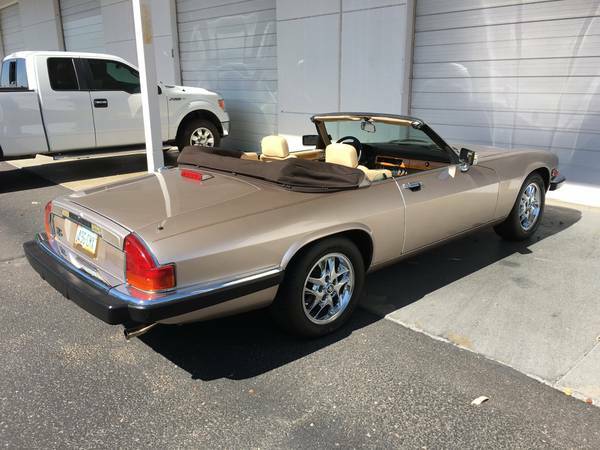 Its always great to see an older Jag finally find a good home. Especially this kind. Very few people would risk taking on a car like this with a running problem! But it will now pay off for you after such a simple, zero cost fix. Welcome to a very exclusive club. So exclusive, its almost like you're the only one in it!! And for a very small investment for sure! Looking forward, it will be refreshing to see more actually relevant X305 posts here. Next time I lift my bonnet, I will be checking all of those throttle linkage nuts. Interesting wheels! Are they oem Jaguar? I don't recall seeing them before. Again, best wishes for your efforts to bring her back into top shape. It will be rewarding. Less than a grand purchase? That's fabulous! The reflection of the bicycle certainly shows the good condition of the paint. What are those wheels called? I'm still not sure how I like the wheels. They are in good condition, but I really love the machined 20-spoke that should be on the car from the factory. Even the machined 6-slot type (MNA6113AA) would look gorgeous on the car, I think. The sale price on the car was $1850. If something was terribly wrong, I figured I could recoup about a grand or so, and would be out less than a grand. It wasn't a huge risk to me, all things considered. With the car in the condition it's now in, I've almost tripled my investment. I did have a bit of buyer's remorse which was gone within about an hour, when I found out the engine trouble was from the throttle linkage. The body is definitely very good, those pictures are just after a quick wash. I haven't touched the car with my Porter Cable yet, which I'll be doing soon. There are a couple chips which need to be touched up and I'd like to clay the car, polish out some minor spider webbing in the paint, glaze and wax. I'll post some more pictures in a better area when that's done to really show off the car. I did spend about two hours going through just the leather inside the car. The cream/coffee interior had dirt film over all the surfaces, which needed to be cleaned thoroughly. I still want to vacuum and shampoo the carpeting and find a good set of floor mats, however I can't seem to find anyone who has new OE mats. There are a few minor issues to get ironed out. I already re soldered the resistor in the Alpine headunit, which caused the CD-changer to have spotty connectivity. In the process, I must've worked the illumination bulb loose behind the display. So the radio has to come out again. There's a wiring issue/short somewhere for the right brake lamp which causes the brake lamp to come on when the parking lamps are on. Replaced the rear LCM, same issue. So I've got to track that one down. I've got a power steering leak from what looks like the steering rack. It leaves a quarter-sized spot overnight. I'll probably need to replace the rack. Well, those wheels are certainly as attractive as the Asteroids which are a perennial favourite for the XJR. Being 16 inch rims, they can run a higher sidewall which helps with curb rash and ride quality. Having second thoughts now on my purchase of a spare set of asteroids. Another small issue I have is that the spare & tools are missing from the trunk. I'll want to find a matching Cosmic wheel, get new tires and mount an existing one on the spare wheel, and find a correct set of jacking tools for the car. I suppose the "correct" set of tire changing tools would be important to some people. But if mine were missing, the new and improved version would be a small hydraulic jack, hockey puck, correct socket and an extendible breaker bar. If I were feeling ambitious, I would make a moulded bucket similar to the factory item by wrapping the above items in plastic film and laying them in spray foam. Nice car for a good price well done. Get the car in the air as your power steering leak could be your rack (especially if it has high miles) but most likely it is a hose or hose connection. These cars are known for power steering hose issues as they age. Check your wheel bearings in the front. When you do your paint I use a 3m product called "Perfect It" it's a three step process, comes in a purple bottles with numbers 1,2 and 3. Also has corresponding 3m polishing pads 1,2 and 3. Can be purchased at any automotive paint shop. This is what the pros use. You must however have a buffer capable of very low rpm's. What you can do with weathered paint with this product is nothing short of phenomenal. Be prepared to spend some time however as you must wash the car, wipe car down so no dust, do the 3 steps, then wax. If you are motivated and do a good job it's 8 hours+ on an XJ12. Good luck. Makes you want one a little, doesn't it! The rear seat room in the 96 is fantastic. The car is like a luxury limo. I appreciate my 95... it is unique, but SWB like your XJR. The 96 LWB is perfect for taking the family out, or for a double date! The back seat room is very impressive, it's almost cavernous compared to my '92 XJ6 which is quite cozy for a car with it's outside dimensions. You can definitely stretch your legs back there with all that legroom. Perfect for road trips. Wow, looks great. Can't believe you got that for $1850! As for now, it's actually my daily driver, as I'm less than 5 miles from work. It's been very dependable, even with the bitter cold winter. What did you spend on replacing the rack? I've got a pretty decent PS leak now, which I suspect (hope) is a hose, but just in case it is the rack, I'm curious what it cost you to replace it. I ended up replacing the steering rack myself. The rack that was on the car looked brand new, but was leaking at the input shaft seal where the steering column connects to the rack. I had to fill the reservoir just about every two days. I drove the car like that for about two months... I look at it as a pretty thorough flush. The steering rack on the V12's is different from the XJ6's. It uses a 4-bolt mounting pattern and has Servotronic. I found it VERY hard to locate a company that had one in stock. I went with CarSteering.com and paid $495 for the rack plus a $250 core charge. I installed the rack myself. I bought new MOOG outer tie rods to complete the installation. The V12 racks are MUCH more expensive than the XJ6 racks, hence the higher price and core charge. It was a very easy process, the toughest part was being upside down on my back under the car in the garage with ATF dripping all over me... I haven't even brought the car in for an alignment yet because I adjusted the toe based on measurements from the old and new rack side by side. Took a few hours for me to put it in, but its SO nice not having to worry about topping up the fluid every couple days. That's not how such a classy car should be treated. Chromed too. First time I have seen other Cosmics since yours, Nick. 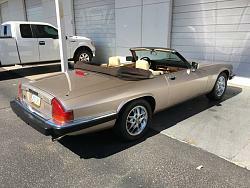 This XJS is on Phoenix Craigslist. Damn is it gorgeous! I think the Cosmics look fantastic on it. How's life with your XJ12 about two years on, Nick? I don't think I'll ever part with mine! Notice how the XJ12 is the most trouble-free Jaguar on the entire forum! There is so little to complain about (knock on polished burl-walnut, stroke the leaper)! Can't find the ONE. Its very frustrating !